The AXIS 5400+ print server is designed to further simplify the printing process, increase network flexibility and maximize the full potential of your printer. Enhanced with Axis? latest software, AXIS 5400+ offers users many new benefits that ensure simple and reliable administration. One of the new features is automatic IP setting (AutoIP) which simplifies installation. Furthermore, the AXIS 5400+ will automatically restart if the print server detects errors in order to ensure highest possible availability (Watchdog). And when the printer requires attention - for example, new toner or a paper refill the print server will automatically notify a chosen administrator by E-mail. Use your time and network resources effectively with AXIS ThinWizard, a powerful Web-based management tool that makes configuration, management and administration of Axis print servers and all other Axis products remarkably simple. Featuring AXIS Print System software for Windows (APS), designed to help install your print server and printer with the correct driver, you will also be able to receive detailed printer information and status.APS also helps you with troubleshooting. 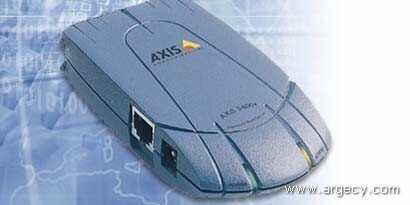 The AXIS 5400+ supports TCP/IP, Novell NetWare including NDS and NDPS, more than 20 Unix systems, Windows NT, Windows for Workgroups, Windows 2000, Windows 95, Windows 98, LAN Server, OS/2 Warp, LAN Manager, LINUX and Apple EtherTalk simultaneously. Support for (1) Parallel printer via Ethernet connection. AutoIP- the print servers will automatically receive an IP address when connected to the network. Watchdog- automatic restart on serious errors. E-mail notification to administrator when printer needs assistance, e.g. Paper or toner refill. Safe Flash loading of firmware updates, since flashloading over the web ispossible. HARDWARE - 32-bit 100MHz RISC-Controller, 1 Mbyte Flash memory, 2MB RAM. FRONT PANEL - 2 LED indicators: Power and Network. Test button for information printouts. Ethernet: Use of IEEE802.2, IEEE802.3, SNAP and Ethernet II frame types simultaneously. Network : Ethernet- RJ-45 connector (Category 5 unshielded twisted pair cable) for 10baseT Ethernet or 100base TX Fast Ethernet. Parallel: 36-pin Centronics connector Parallel port, high-speed IEEE-1284 compliant. Sustained throughput over 1 MB/sec using NetWare. Bi-directional support for Apple EtherTalk, Reverse Telnet, PROS. ECP support. Root password, User access list and printer access. NetWare: Encrypted passwords, NetWare Packet Signature Level 1, 2, 3. Logical: The logical printer ports can be programmed to perform auto ASCII to PostScript conversion, string before and after job,string substitution, alternative output and character set conversion. SNMP-MIB II compliant (over UDP/IP and IPX), private enterprise MIB included. Print server/job/printer status presentation and management via NWAdmin/PCONSOLE. Supports NetWare : IPX, IP, SAP, RIP, SPX and NCP (extended with NDS), NDPS, NLSP, DIAG, and LIP. Windows and OS/2 : NetBIOS/NetBEUI or TCP/IP, WINS. TCP/IP : LPD, FTP, Telnet, Reverse Telnet, PROS, BOOTP, RARP, DHCP, ICMP, IGMP, IP, TCP, UDP, HTTP, SNMP, TFTP, SLP, Raw TCP, IPP, DNNS. Novell NetWare: NetWare 3.11, 3.12, 4.10, 4.11, 5 and above. and 96 print queues are served. Supports user messages. NDPS supported by versions 4.11 and above. Microsoft LAN Manager: LAN Manager 2.0c and above, running under OS/2 ver.1.3 and above. IBM: LAN Server 1.3 and above, running under OS/2 ver.1.3 andabove, including OS/2 Warp, OS/2 Warp Connect. Microsoft Windows: Windows NT ver. 3.5 and above, Windows for Workgroups, Windows 95/98/2000. Print Method: NetBEUI, LPR, Raw TCP. Graphics IRIX, DEC Alpha OSF/1, BULL (BOS, AIX). Other systems:IBM (MVS, VM, VSE, OS/400), DEC VMS, guidelines for other systems. Print Methods: LPD, FTP, PROS (named pipe & filtered), Reverse Telnet. Apple EtherTalk: Print Method: AppleTalk Phase 2. LANtastic: LANtastic 7.0, from any of the supported Windows' clients defined above. POWER- Power provided by external supply: Maximum 2,4 W.
SIZE - 2.40"w x 0.90"h x 4.80"d WT.- 0.22 lb.